Whole number arithmetic is the foundation of higher mathematics and a core part of elementary mathematics. Awareness of pattern and underlying problem structure promote the learning of whole number arithmetic. A growing consensus has emerged on the necessity to provide students with the opportunity to engage in algebraic reasoning earlier in their education. In fact, the U.S. National Council of Teachers of Mathematics curriculum standards and the nationwide mathematics reform call for algebra readiness in elementary mathematical learning. 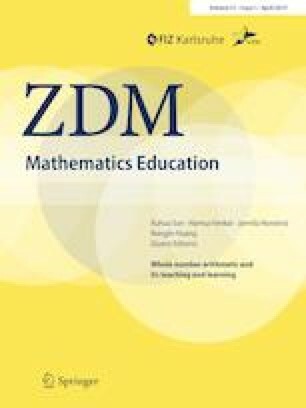 The purpose of this study was to evaluate the effect of Conceptual Model-based Problem Solving (Xin, Conceptual model-based problem solving: Teach students with learning difficulties to solve math problems. The Netherlands: Sense Publishers, 2012) intervention program, with the Singapore bar model method (Kaur, The model method—A tool for representing and visualising relationships, In: Conference proceedings of ICMI study 23: Primary mathematics study on whole numbers, pp 448–455, 2015) serving as the bridge towards symbolic mathematical model equations, on enhancing additive word problem-solving performance of elementary students who are struggling in mathematics. Findings from this study indicate the promise of this program. Through representing a range of additive word problem situations in one cohesive mathematical model equation, students are prepared for generalized problem-solving skills. The study reported in this paper was assisted by You Luo, a former graduate students at Purdue University. The author would like to thank the administrators, teachers, and students at Lafayette School Corporation who facilitated this study.